Happy Saint Patrick’s Day from avstrategies! Lá Fhéile Pádraig Sona Daoibh! (Happy Saint Patrick’s Day everyone!) from all of us at avstrategies! 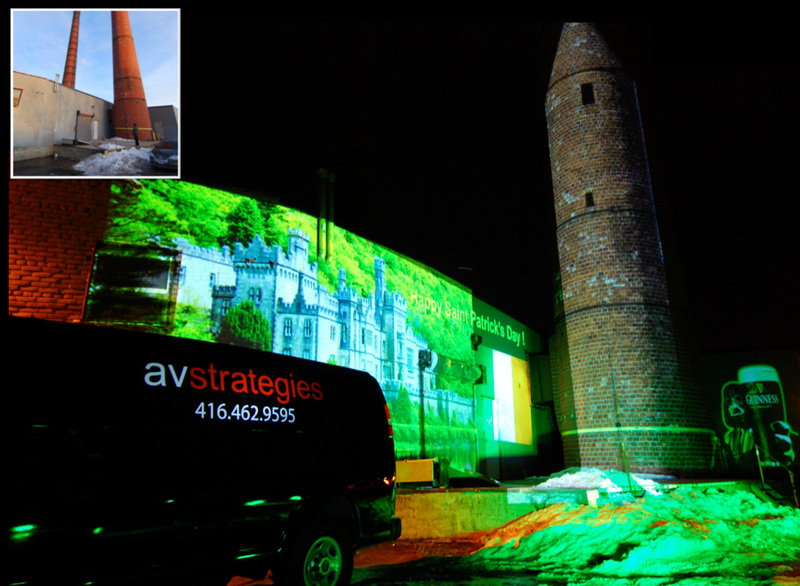 To mark the occasion our Toronto guys transformed their loading dock into a poster board with Irish imagery using outdoor projection. Including a 10th Century Irish Round Tower which was projected on a large smokestack, and an Irish Castle dating back to to the mid 1800’s, they finished the scene off with a cheeky Guinness on the side and some Green LED lighting on the remaining stubborn snow! AV Strategies is a Canadian Audio-Visual Event Services company with branch offices across Canada. We are looking for a Senior Production Manager to join our Vancouver team working on national event activations. The successful candidate must have a minimum of 5 years of experience working as a team leader/project manager in the A/V rentals industry. This person must have a resume that includes live sound engineering for large scale concert applications, visuals engineering experience with multi-camera switching, HD projection, seamless graphics switching, LED Wall technology, simultaneous interpretation equipment, etc. A valid BC driver’s license or the ability to attain a BC driver’s license is required. Meet clients, analyze requirements, and design appropriate audiovisual solutions for large events, festivals and concerts. Work effectively as a team member to execute multi disciplined audiovisual staging projects. We offer an attractive compensation and benefits package including, basic and extended health, dental care plan, and disability and life insurance benefits.